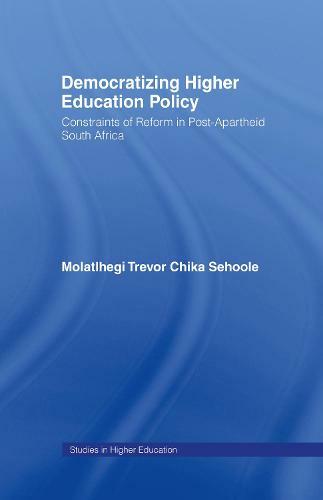 This book was written with the purpose of analyzing the challenges faced by the post-apartheid government in South Africa with regard to reform of higher education. It covers the apartheid context of higher education, resistance to the system and its ultimate demise, democratic processes in post-apartheid reform agenda and how this agenda was emptied of its radical content as a result of global and local pressures. Highlighted are key constraints in the reform process, including the compromise pact agreed upon between the apartheid government and the ruling African National Congress, the rapidly globalizing environment underpinned by neoliberal principles within which South Africa's transition took place, shifts in macro-economic policies of government towards neo-liberal policy, the inheritance of the bureaucracy and the inexperience of new government officials. These are presented in a narrative style that combines the author's experience, the voices of key players involved and important data from a range of documentary sources. This is the first single authored book in post-apartheid South African that has systematically looked at higher education reform.